When it comes to cutting costs 'man becomes creative'. 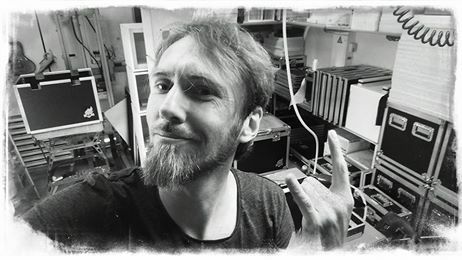 To enable guitar recordings in his home studio, Ulysses axe-man Sylvester Vogelenzang de Jong designed and built his very own iso booth. Soon after finishing the recordings (2008), Sylvester took his isolated guitarspeaker on stage. Colleagues and technicians commented on the unorthodox box. Within weeks request came to build some for befriended musicians and studios. With a name like "Box of Doom" for his cabinets, Sylvester soon drew the attention of studios, musicians, technicians, theaters all over the globe. The Box of Doom is a boutique product and build by hand. Production and distributed by Symbioses Music, once started as recorded company for Ulysses.. now also the company behind the BoD. The small company is located near Rotterdam in The Netherlands. As a "one man army" (together with a handful of enthusiasts), we make sure you get what you deserve: the ultimate tool for a musician. Crafted with care and ready to rock!